Tours and Tastings Weekdays at 10:00 a.m. by appointment. Situated on the western edge of St. Helena, at the foot of the Mayacamas Mountains, Spottswoode is located on the northernmost part of the Napa Valley bench. The vineyard consists of 33 acres of Cabernet Sauvignon, with the remaining plantings made up of Cabernet Franc, Petit Verdot and Sauvignon Blanc. The 37-acre estate is hand-farmed as a mosaic of 24 different blocks, 18 of which are Cabernet Sauvignon, offering varying combinations of clone, vine age and rootstock. As one of the pioneers of organic viticulture in California, we have farmed without the use of synthetic chemicals, pesticides or fertilizers since 1985, and were one of the very first vineyards in Napa Valley to receive organic certification by the CCOF in 1992. In addition, Spottswoode is both Napa Green Winery and Vineyard certified and 100% solar run. Our intimate tour and tasting experience begins with a walk around the entire estate, including the historic Spottswoode home and gardens, our vineyard, production buildings, and “ghost winery” stone cellar, finishing with a seated tasting of the current vintages of our Spottswoode Estate Cabernet Sauvignon, Lyndenhurst Cabernet Sauvignon, and Spottswoode Sauvignon Blanc. To join the wine club, visit www.spottswoode.com or call 707-963-0134. We have a private mailing list, through which interested consumers receive a newsletter and the opportunity to buy our wines direct from the winery on an annual basis. Spottswoode Estate Vineyard & Winery is certified under the Napa Green Winery Program by the Napa County Department of Environmental Management (DEM) and the Association of Bay Area Government’s (ABAG) Green Business Program and completed all the regulatory components needed for environmental sustainability. These components included developing water and energy conservation methods, preventing pollution, and reducing solid waste. In addition to developing sustainable winery practices, this program is set to become the standard for the state of California. Spottswoode Estate Vineyard & Winery is certified under the Napa Green Certified Land Program. 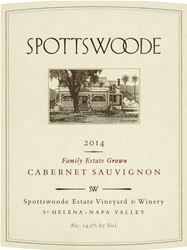 Spottswoode Estate Vineyard & Winery has created and implemented a customized farm plan with measured results that addressed all aspects of its property, vineyard land as well as non-farmed land, including practicing soil conservation, water conservation, stable drainage, riparian corridor enhancement, fisheries and wildlife habitat enhancement and long-term improvement and sustainability.